Our collated numeric tabs are ideal for legal departments of large corporations, law libraries, litigation firms and government agencies. • Tabs are offered from 1-500 in a set of 25 numbers. Select your numbering. 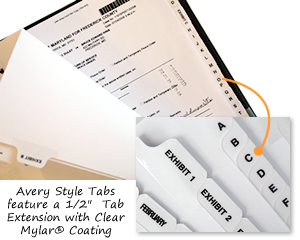 • Choose from hole-punched and tabs with Mylar edges. • We offer tabs in the most common Avery style for quick visibility. Quick. Easy. Great price. I've ordered many many times and will continue to be a repeat customer. Product and service are excellent! super fast delivery and the product is excellent! This company is wonderful to deal with! It is great and would be awesome if you had index for them as well.